Detects the N-methyl-D-aspartate (NMDA) receptor type 2B. 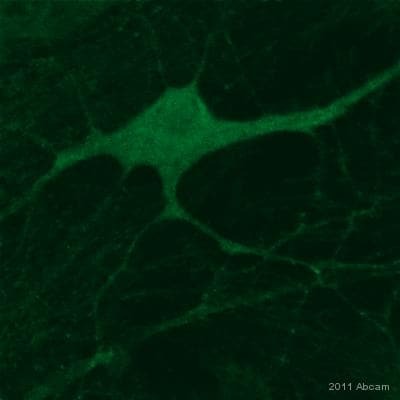 This antibody has been tested in mouse and rat brain in western blotting. It has not been tested in human for Western blotting - only for ICC on transfected HEK cells. Recombinant fragment corresponding to Rat NMDAR2B aa 934-1457. Our Abpromise guarantee covers the use of ab28373 in the following tested applications. WB Use a concentration of 2 µg/ml. Predicted molecular weight: 166 kDa. NMDA receptor subtype of glutamate-gated ion channels with high calcium permeability and voltage-dependent sensitivity to magnesium. Mediated by glycine. Belongs to the glutamate-gated ion channel (TC 1.A.10.1) family. NR2B/GRIN2B subfamily. Cell membrane. Cell junction > synapse > postsynaptic cell membrane. ab28373 staining NMDAR2B in Human breast tissue sections (right) compared with negative control (left) by Immunohistochemistry (IHC-P - paraformaldehyde-fixed, paraffin-embedded sections). Tissue was fixed with paraformaldehyde and blocked with 3% H2O2-methanol for 15 minutes at room temperature; antigen retrieval was by heat mediation in a sodium citrate buffer. Samples were incubated with primary antibody (1/20) overnight at 4°C. A HRP-conjugated secondary antibody was used for detection. Samples were incubated with primary antibody for 12 hours at 4ºC. Blocked with 5% milk for 1 hour at 22ºC. Overlay histogram showing SH-SY5Y cells stained with ab28373 (red line). The cells were fixed with 4% paraformaldehyde (10 min) and then permeabilized with 0.1% PBS-Tween for 20 min. The cells were then incubated in 1x PBS / 10% normal goat serum / 0.3M glycine to block non-specific protein-protein interactions followed by the antibody (ab28373, 1µg/1x106 cells) for 30 min at 22ºC. The secondary antibody used was DyLight® 488 goat anti-mouse IgG (H+L) (ab96879) at 1/500 dilution for 30 min at 22ºC. Isotype control antibody (black line) was mouse IgG1 [ICIGG1] (ab91353, 2µg/1x106 cells) used under the same conditions. Acquisition of >5,000 events was performed. This antibody gave a positive signal in SH-SY5Y cells fixed with 80% methanol (5 min)/permeabilized with 0.1% PBS-Tween for 20 min used under the same conditions. Publishing research using ab28373? Please let us know so that we can cite the reference in this datasheet.